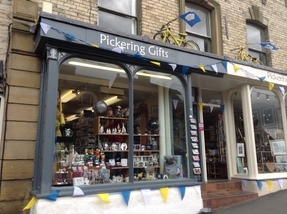 We are situated at the top of Market place and offer you an exciting and extensive range of gifts, greeting cards and a very friendly service. Our outstanding selection of quality products encompasses the well known brand names of Border Fine Arts, Old Bob, Peter Rabbit, Kelly Rae Roberts, Art Hearts, Allen Designs, Ewe to me, the 2014 award winning Gifts in Tins, Willow Tree, Tuptonware, Juliana and so much more. We have a wide selection of quality gift boxed necklaces, bracelets, bags etc, and for the collector an extensive range of jigsaws. We are stockists of Farrahs of Harrogate delicious toffee, fudge and biscuits for that treat to take home. We update our gift range frequently so please do keep checking back for ideas and inspiration for the perfect gift. We accept all major credit and debit cards including Amex and paypal.